Learn how to convert H.264/HEVC to H.264 for free with best free H.265 video converters 2019 on Windows (10) or Mac. 2 best free solutions are included here. When You Need to Convert H.265 to H.264? 1. H.265 is more superior to H.264 in regards to video quality, size and compression rate. Namely, to achieve the same visual quality, H.265 encodes a more compressed video that is about half the size of H.264, at only half the bit rate. 2. Two key improved features of H.265 (HEVC) compared with H.264 (AVC) are the support for higher resolution videos like 4K/8K UHD resolution and improved parallel processing. H.265 will save much bandwidth when compressing and streaming 4K/8K videos online. 1. H.265 is not that compatible as H.264. For instance, GoPro 4K HEVC videos are not friendly to many editor apps. In another words, H.265/HEVC iis not widely applied in many products fields so far, except a few devices and media players like iPhone 6/later, Windows 10, 5KPlayer, etc. 2. H.265 may be prior than H.264 in the next five or ten years along with the popular application and streaming of 4K UHD resolution, but right now if your gadget's resolution is up to 720p/1080p, H.264 is more suitable. By making it clear the main differences of H.265 and H.264, the advantages and disadvantages of H.265, and figuring out the truth that many devices, media players and mobiles don't support HEVC playback so far and H.264 still dominates now, which makes H.265 to H.264 conversion sensible. Let's come to what's the best free H.265 to H.264 converter and guide on how to convert GoPro/YouTube/Apple H.265/HEVC video to H.264 which is compatible with wider range of products and devices at present. – Best professional 8K/4K/HD video converter enables you to flawlessly convert H.265/HEVC to H.264 with original quality at fastest speed thanks to its hardware acceleration tech, Intel QSV, Nvidia CUDA/NVENC. – Easily convert MKV, M2TS, AVCHD, MOD, HD camcorder videos, Blu-ray videos, and standard MP4, AVI, MPEG, WMV, MOV, VOB, FLV, RMVB, WebM, etc. 370+ output video/audio codecs and 410+ device profiles are provided. It is not recommended to use free online video converters to convert H.265/HEVC to H.264. Most online video converters only support small video files conversion, e.g, lower than 20MB. Besides, The speed of converting videos online is always very slow and the process is not stable, together with poor output video quality and sometimes malware/virus saved along to computer. So, if you aim to convert large video files, like large 8K/4K/1080p H.265/HEVC videos that come from GoPro action camera, Apple iPhone 7, iPhone 8, iPhone X, Samsung Galaxy S9 (+), Xiaomi Mi MIX 2S, YouTube, etc, a solid clean and easy-to-use free H.265 to H.264 converter may be more preferred. 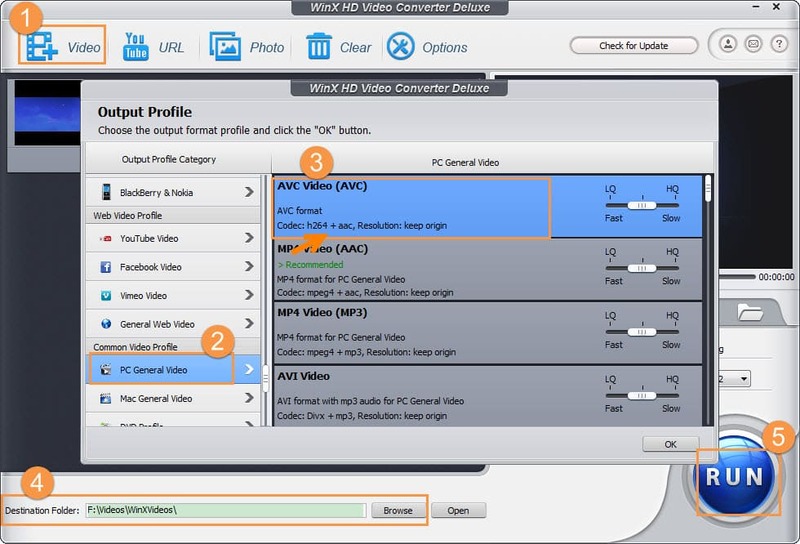 Here we sift best 2 free H.265/HEVC converters, WinX HD Video Converter Deluxe, Handbrake, from market and gives detailed step-by-step guide on how to use this two programs to easily change H.265/HEVC to H.264/MP4 for free on Windows (10) or Mac with the best output effects. WinX HD Video Converter Deluxe, a well-known superfast Ultra HD video converter, is top recommended for H.265/HEVC to H.264 conversion. This versatile software is powerful enough to fulfill all popular videos conversions in whatever format and resolution. You can use it to easily convert HEVC/H.265 to H.264 for free or vise versa flawlessly at world's No.1 fast speed. To put it briefly, it is an all-in-one high-end 8K/4K/HD/SD video converter, free movie video downloader, video editor, photo slideshow maker. Support platforms: Windows 10 (32 & 64 bit), Windows 8/8.1 (32 & 64 bit), Windows 7 (32 & 64 bit), Vista (32 & 64 bit), Windows XP, 98, NT, 2000, 2003. Pros: Intuitive interface, ultra user-friendly, clean, stable and superfast. 1)	Convert all popular 8K/4K/1080p/720p HD videos H.265/HEVC, MKV, M2TS, AVCHD, convert H.264, AVI, MP4, WMV, MPEG, MOV, FLV, etc. with original quality at fastest speed. A 2-hour feature-length movie can be converted from AVI or MKV to MP4 in about 10 minutes. 2)	Free download full movies, 8K/4K/1080p/720p videos, VR movies/videos, 3D videos from YouTube, Dailymotion, Facebook, Vimeo and 300+ video sharing sites. 3)	Free download music, MP3 songs from Vevo, SoundCloud and many other free music download sites. 4)	Support 370+ output formats, 410+ output device profiles incl. iPhone X, 8/7/6S/6 (Plus). 5)	Edit, trim, crop, merge, subtitle videos before converting H.265/HEVC to H.264. Versatile parameter settings are accessible. 6)	Hardware acceleration Intel QSV, Nvidia CUDA/NVENC and Hyper-threading tech are supported to ensure fastest conversion speed. Step 1: Make sure you have installed WinX HD Video Converter Deluxe on your Windows (10) computer. Launch the program and click + Video button on its top-left. Select the H.265 (HEVC) source video files you'd like to convert to H.264 (AVC) from computer. Step 2: In the pop-up Output Profile window, choose H.264 (AVC) as the output. Click under: PC General Video --> AVC Video (H.264). This program provides many other output video formats encoded H.264 codec, such as MP4 (h264), you can feel free to choose according to your own needs. Optional operations: Click Edit button to trim video clips, crop videos, adding external subtitles, etc. 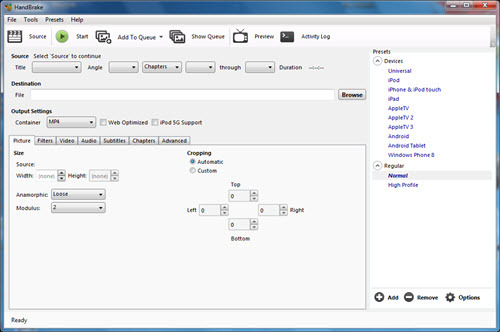 ; Click Settings button next to Profile icon to adjust video/audio parameters to achieve desired output results before converting HEVC/H.265 to H.264. Step 3: Click Browse to specify a destination folder to save the converted video file. Hit RUN button to start to convert HEVC/H.265 to H.264/AVC for free on Windows (10) or Mac with this high-class H.265/HEVC converter at lightning speed. Another way to convert H.265 to H.264 for free is using Handbrake. Handbrake is a famous free and open-source video encoder program mainly focusing on ripping regular DVDs or converting videos to MP4 or MKV container in H.264/H.265 codec, and to some iPhone iPad preset profiles. People who have used this software figure out that it has complex interface and settings which are more suitable for experienced users. 1)	Support H.265/HEVC and other single video files, video folders, and DVD disc input sources. 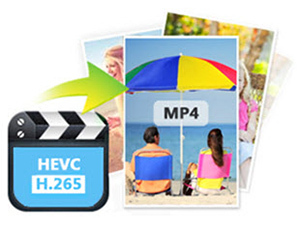 2)	Convert various video files like H.265/HEVC to MP4 or MKV format in H.264, MPEG-4, and MPEG-2 codec for free. 3)	Fast rip non-protected DVD to MP4 or MKV (only support these two output video formats) for free. 4)	Various advanced video/audio/image parameter settings. Pros: Free and fast. Versatile advanced settings. Cons: Handbrake always outputs bad video quality that can't watch. It takes quite a long time to load source video and convert video. It sometimes crashes in the middle before finishing the conversion process. Besides, Handbrake is not updated often and lacks technical support. 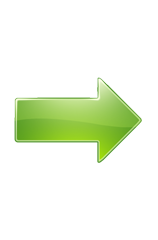 The interface and settings of Handbrake are complex and it is not suitable for new beginners. Step 1: Download Handbrake (latest version 1.1.0) from its official website. Install and open it. 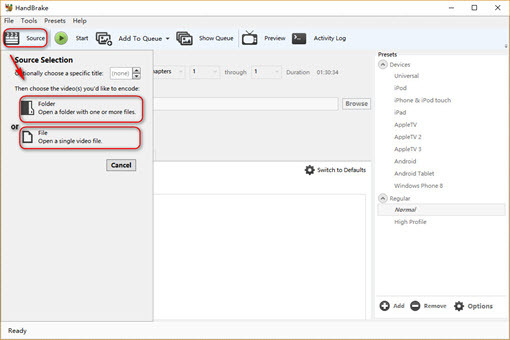 Step 2: Click Source button to load folder with one or more H.265/HEVC video files, or choose a single H.265/HEVC video file. Step 3: Next click Browse button to set a target folder to store the converted H.264 video. Step 4: Choose MP4 or MKV as the output video container. Step 5: Then hit Video tab to select H.264 (x264) video codec as the output and adjust other video settings like frame rate, bit rate, etc. Step 6: Hit Start button on the top left to start converting H.265/HEVC to H.264 for free with Handbrake on Windows 10/8/7 or Mac. You may be using free Handbrake to convert H.265 to H.264, but if you meet problems using Handbrake, turn to its best alternative - WinX HD Video Converter Deluxe. * Convert H.265/HEVC/MKV videos to H.264, MP4, MPEG, AVI, WMV, MOV, FLV, iPhone X/8/Plus, Galasy S8/S9, etc. at fastest speed. Converting a 2-hour MKV movie file to MP4 format only costs about 10 minutes. * Free download MP4 8K/4K/HD 1080p/720p movies (Hollywood/Bollywood), videos, TV shows, VR videos, 3D movies, MP3 songs from YouTube, Dailymotion, SoundCloud and 300+ sites. 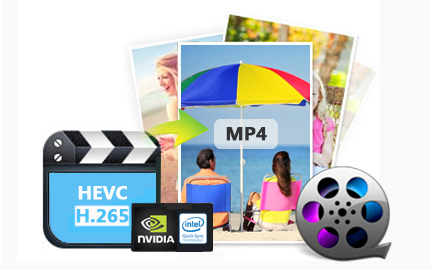 How to Convert Video to H.264 with Best Converter? Plex Won't Play 4K HEVC/H.265? How to Fix Plex HEVC Playback Issue?